You can’t have a legitimate city resource without a list of juicy burger hot spots!! So here ya go: Curbside’s burger must haves, DC style. One of my favorite places! I was here last week and tried almost everything on the menu (not by myself, of course!). It’s all mouth watering good, particularly for meat eaters. 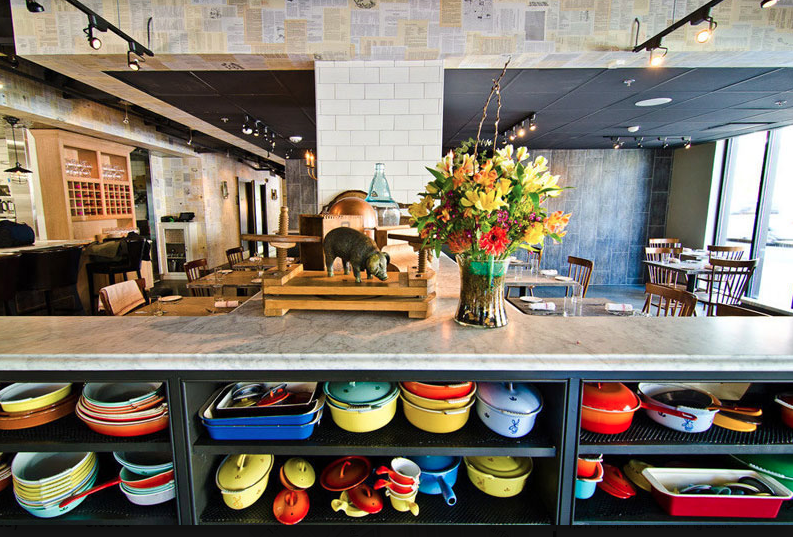 Plus, it has an awesome, cozy vibe that really adds to the experience. If you’re not feeling like a night in a restaurant, stop by their butcher shop and find something to throw on the grill. I promise you won’t be disappointed. The crazy thing is, this place isn’t even known for it’s burger! There are so many delicious items on this menu that you really can’t go wrong. But since this is about the burger, do yourself a favor and don’t leave it out of the equation. #Yum. If you’re looking for a menu packed with burger options, would you ever consider anywhere other than Bobby Flay’s Palace?? Nope! Talk about a slew of interesting burger concoctions brought to you by a national favorite in all things greasy and delicious. Haven’t been disappointed yet! Three words: Bacon infused burgers…..You’re welcome. If you’re looking for a juicy burger, you’ll definitely find it here. ALSO, if you’re looking for a veggie burger that gets just as high reviews — it’s your lucky day. Just steps from the White house and all our monuments, you’ll find a gorgeous building that doesn’t look anything like a grille! 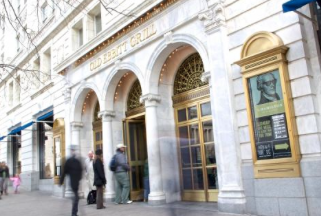 Welcome to Old Ebbit; where booths are made of mahogany and velvet; the bar is set in marble, brass, and beveled glass; and the decor includes antiques and history that date back to 1856. Old Ebbitt has found an interesting way to incorporate their famous oysters into their Riot Burger — yep, you heard me right! Oysters in a burger along with horseradish mayo and bacon. Wowzers! But if that doesn’t tickle your fancy, you have 5 other amazing options (including a veggie and salmon burger) that are just as satisfying. Long in short, you’re not only getting an amazing burger but you’re getting a meal set in history and convenient enough to tour the nation’s monuments after! From Kuwait, to Bahrain, Qatar and numerous spots in the United States; this place is making a global impact. Elevation burger is very health and environment motivated, feeding their customers 100% USDA certified organic, grass-fed, free-range beef and taking special care in counting calories and collecting all nutritional information so it can be shared with their customers. You’ll find guilt-free options all the way to cheat-day options as well as a menu of shakes, malts and yummy toppings. This place is more of a grab-and-go spot, but one that won’t disappoint! I’m going to take a wild guess and assume you’ve heard of this place. If you haven’t – I’m not sure how not! Five Guys has gone international, and there’s a reason. Somehow, no matter what location I’m at, I always love my burger. They offer a great quality, fast food product that tastes classic and satisfying. So the next time you’re craving a quick burger — you know of a place. I know what you’re thinking — a FISH restaurant on a BURGER list? Yes. That’s what I’m saying. You’ll love it. But go with a big group of people and try everyone’s fish meals, also, because they’re just as stellar. 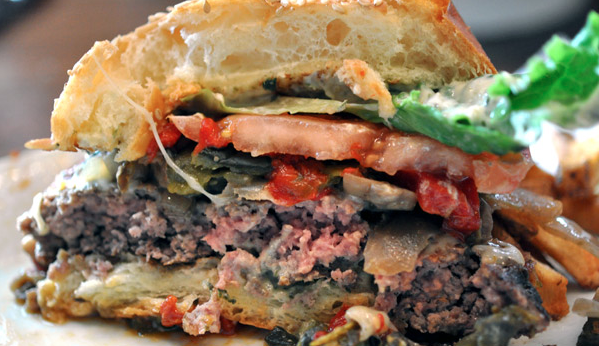 Here’s an upscale place with an upscale burger. 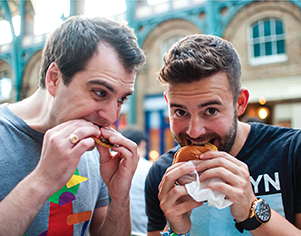 Ever tried a lobster burger? I hadn’t either, but I can’t wait for my next one! A beautiful restaurant with some tasty burger options. If lobster isn’t your thing, you can also try a chicken lemon burger, an ahi-tuna burger, or your classic burger with optional cheese or bacon. Whatever you choose, you’ll love this swishy place. From burgers topped with chili, foie gras, pulled pork or pineapple salsa; and patties ranging from beef, to veal, and ahi-tuna — your taste buds are sure to have a party with whatever interesting pairing you choose. My son celebrated his birthday here a few years ago and we all went home talking about their extensive, creative and mouth watering menu for days. 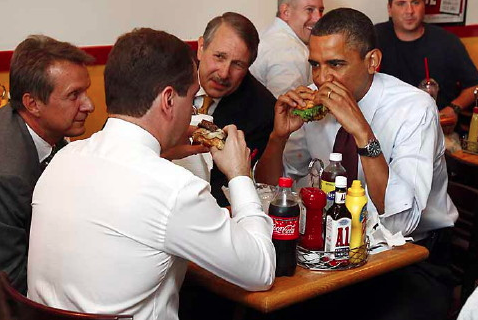 Remember that time Obama left the White House because he just had to have a burger?? — Well, it was Ray’s burger that he was craving! Quite honestly, I haven’t had the pleasure of trying this burger yet. However, my family and I tried Ray’s Hell Burger a few years ago and we all thought we had some of the best burgers any of us had ever tasted. I have no doubt that his new place is just as amazing. Ray’s burger joints tend to have few decorative frills so that the burgers can speak for themselves. And they certainly do. Last, but obviously not least, we’ve got Shake Shack! My sister in New York City loves this place, and now it’s come to DC. Though this has been a meat lovers blog post, I’m going to have to rave about their vegetarian option, the ‘Shroom Burger. It’s incredible. And good news, this hot spot has a number of locations and continues to grow, so clearly everyone’s raving about all of their other burgers, also! To top it off, they have items on the menu for your dog, too! ….Yes. My dog, Sheldon, is a Shake Shack regular. More and more it seems I’m working with families who ask for beautiful garden spaces. Some houses in Washington DC or the neighboring suburbs that make up the DC metropolitan area offer gorgeous, quaint gardens; whereas other properties feel too trapped in urban environments that previous owners don’t see the possibility for a garden. If you need to live in the city for work, but you want to have that serene, garden escape — I’m here to tell you that you can have it all!!! 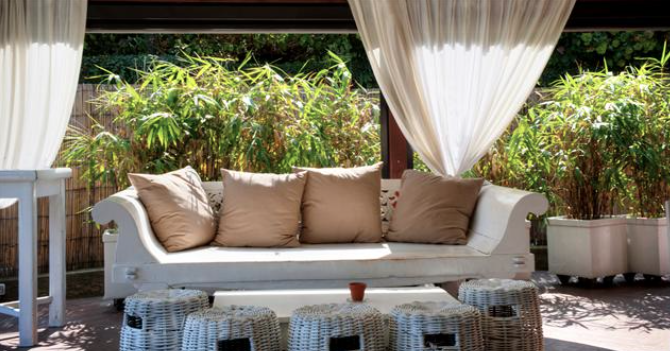 Here are a few ways to accomplish that urban patio sanctuary! 1. 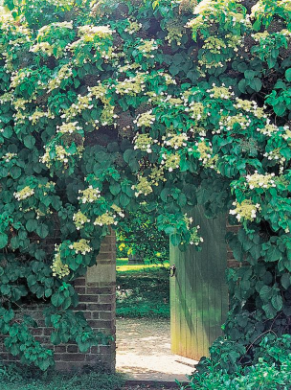 An arched trellis is perhaps the perfect way to fool yourself into thinking buildings are miles away! With the greenery growing on top of you as the sunlight filters through the healthy leaves, you’ll create a beautiful privacy for your morning coffee, or simply your escape after your long workday. 2. Decorate with minimalist furniture, keeping to simple and muted color tones so you may maintain that fresh, organic feel and look while allowing the greenery and flowers around you to be the centerpiece. Sticking to a white color pallet and decorating with natural wood and stone will boost your feelings of relaxation and offer the perfect contrast to your outside, urban environment. 3. 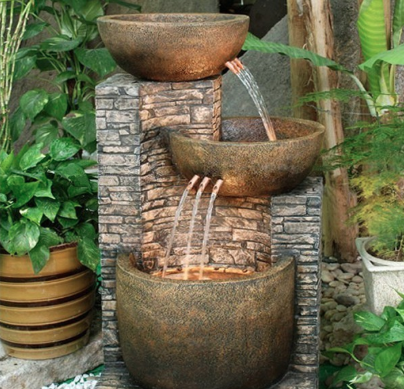 Install a water feature!! Can you think of a more peaceful sound than flowing water? Not only will this gorgeous white noise filter out the beeping on the street, but it will be beautiful to look at and only add to your serene and fresh garden escape. 4. If you have a narrow patio space with obstructed views from neighboring buildings, you have the opportunity to do something very special! 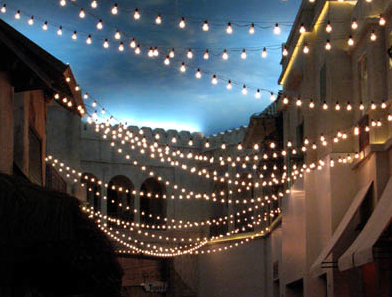 Use the vertical space to hang string lights above you, automatically transforming what would have been a flaw into a feature that makes your garden escape unique to most. 5. Choose luxurious seating. While keeping to the muted color pallet discussed earlier, no one said anything about sacrificing comfort! Choose furniture that gets you excited about lounging there for hours. Find something plump with big comfy pillows and surround it with your favorite potted plants. You’ll not only be building a garden escape, you’ll be creating the perfect hangout for your favorite people. Enjoy and tweet us photos @CurbsideInDC of all that you’re creating! Living “green” is not a fad, it’s a necessity. As growing awareness of our civilization’s impact on the environment increases, people are thankfully opening their minds to adapting clean-green lifestyles! Awesome. So we’ll all save up for that hybrid car and full solar system installation! In the meantime, however, no one knows what else to do! Obviously, how you decide to live cleaner and greener depends on where you live, what natural resources you have available to you, your lifestyle etc. There is no “one-size-fits-all” solution to going green (or greener), but there are certainly day-to-day activities that will help you do more than just wait for the day that you can afford the expensive new car so you can help your planet. Instead, start making a difference right away! 1. Knowledge is power. Learn more about sustainable living. As time consuming as it is, this is an important step. Read up on the subject of environmentalism and how your personal carbon footprint can affect global pollution levels. There are plenty of resources available online, even if it means you just watch one youtube video a day on the subject over your morning coffee. Not many go to libraries anymore, but you can be sure to find tons of material there, too! 2. Turn off your lights!! The most effective way to cut down on your carbon emissions is to conserve on energy in your home. Install energy-efficient light bulbs, turn lights off when they aren’t in use, make sure your walls and floors are properly insulated and windows are fully sealed, and keep your energy consumption to a minimum. You will save both energy and money at the same time. 3. Conserve water. Every drop of tap water you use consumes energy! Before water reaches your tap, it is transported, filtered and purified. A lot of fossil fuel is consumed in the processing of it. In some parts of the world, water is scarce. You don’t need to keep the water running while you’re brushing your teeth, or your washing the dishes! Switch to more efficient washers and dryers, make sure your loads of laundry or dishes are packed to the brim before deciding to run a wash, and perhaps even collect rain water for use in your garden as opposed to tap water. 4. Use less fuel. Find opportunities to use your bike, rollerblades and skateboards! Whenever you have to travel a short distance, why not take a leisurely walk to get there? If your work place is too far for a bicycle ride, consider mass transit or organizing a carpool. I know that it’s not the most convenient means of transport, but it can make a huge difference. 5. Did you know that eating greener food can make an impact on the environment? The food industry contributes substantial carbon emissions in the process of shipping their products around the world. When you make the choice to eat natural, seasonal, local and organic food, you help to conserve the environment while keeping an eye on your health. It’s a win-win! 6. Think about how you’re making your purchases. Instead of buying brand new, wooden furniture for your home, search online for good, used furniture. Or, visit a garage sale! You’d be shocked with the luck I’ve had at garage sales. As a result I was able to reuse an item instead of letting it get trashed! Buying groceries in bulk can also save money and conserve on energy and packing materials. Buying high-quality products that last longer and won’t just end up in a landfill one year from now is a huge help to the environment. Whenever possible, buy products that have a fair trade label. That means people were paid fairly for the construction of them, and usually ensures environmental care as well. Shopping online is another energy saver! When you receive a purchase through the mail, the amount of fuel used to ship that purchase is no where near the amount of fuel you would have used driving to the store. This also saves you time, and many stores offer free shopping so, again, we’re looking at a win-win! 7. Use proper waste management. Hopefully we’re all reducing, recycling and reusing in this day and age! However, even if you’ve mastered this in your household, be aware that it takes a lot of energy to process and dispose of waste, whether it’s recycled or dumped in a landfill. So, conserving waste is still important even if you recycle. Keep a watchful eye on your waste and what you can compost. 8. Your choice of clothing can make a huge impact on the environment! Chemicals such as insecticides that harm the environment and harm peoples health are used over cotton crops. Organic cotton, hemp, bamboo and flax are alternatives to the commonly used cotton that is not only better for the environment but better for your health! 9. Similarly, you might be surprised at the harmful chemicals that are in some of our every day products. Use products made from natural and nontoxic ingredients. Amazon has an entire section dedicated to green products. By shopping at Amazon, not only are you finding nontoxic and environmentally friendly products more easily, but you are saving money and conserving resources by doing your shopping online! Let’s take this seriously. This is our HOME and right now, she’s suffering. I’ll try to blog more often about this topic, it’s something we all need to be spreading awareness about. 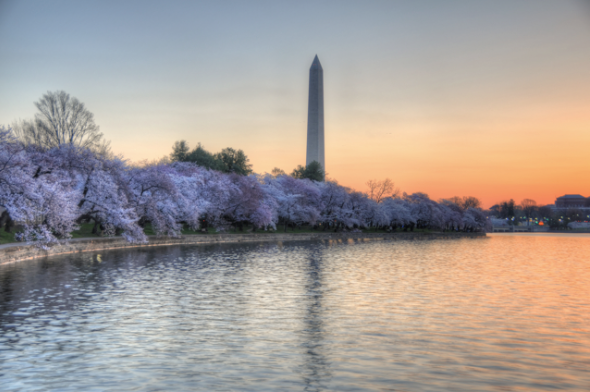 Yep — there’s still plenty more fun to be had in our Nation’s capital. Check out the next 9 Curbside hot picks for what your kid’s want to be doing with the rest of their summer. 8. We all know D.C. is jam packed with museums, but did you know they often have a special summer schedule geared to entertaining (and teaching) your kids? Here are some of our faves, all of which are free! If your kids like to get their hands dirty, take a trip to the U.S. Botanic Garden! Kids can become “junior experts” with the backpack they borrow from the visiting center (I hear there’s even a plant fossil inside!). At the Botanic Garden, your kids will roam the conservatory and get hands-on with the plant world as you complete a 16-page adventure workbook. Your kids will learn about endangered plants, plants used for medicines, and discover how plants survive in environments such as deserts and jungles. The adventure will include a workbook that may require more than one visit or perhaps even work at home. A real botanist will review the workbook before giving a certificate and badge to your child with the title “Junior Botanist.” All Junior Botanists get a behind the scenes look of the conservatory’s plant collection. Only one third of the plants are on public display at one time, just imagine what your kids will be experiencing in those greenhouses! On July 16th, Amelia Earhart will be making an appearance to share her adventures with your kids, as will NASA astronaut Patrick Forrester as part of the museum’s “Milestones in Aviation and Space” program designed for families. Bring your kids to an opportunity of learning and exploring the ways of how aviation and space have changed the world. On July 25th, you can celebrate “Discover the Moon Day!” Steer a robotic rover, examine meteorites that were found on the moon, see the capsule that took the Apollo 11 astronauts to the moon and back, and view images of the lunar surface using 3-D glasses. Open Monday-Saturday 10 a.m. to 5 p.m., Sunday 11 a.m. to 6 p.m. This program is for ages 8 to 11, with adult participation. Intro videos are for ages 4 and up. Click “National Gallery of Art” link for film details. For all those with little artists, The National Gallery of Art has an entire summer program, also. The stars for this summer are American artist, Mary Cassatt, and French artist, Edward Degas; close friends after meeting in 1877. The museum is showing both short and full length films about the pair as well as offering a “Degas/Cassatt” exhibit, which will run until October 5. On the weekends, the museum’s Artful Conversations program lets kids and parents explore a single piece of art for an hour. You may sketch it, write a poem about it or create a soundtrack to bring it to life. Attend three or more programs and you’ll get a prize! 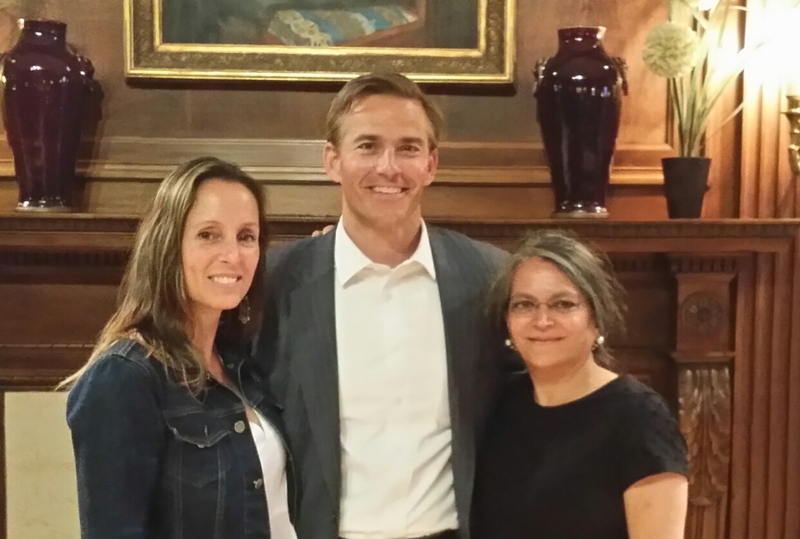 Click HERE For information about Artful Conversations. Open daily from 11:30am – 7pm. Discovery kits are available on some Saturdays from 1 to 4 p.m. and some Sundays from 2 to 5 p.m. To check dates, click link above. The kits are for ages 5 to 14, with adult participation. Finally, the National Portrait Gallery has a museum Portrait Discovery Kit complete with detective guides and seek-and-find cards to help you zero in on the famous people hanging around the gallery. Each kit also comes with a doll in a costume to be compared to what the subject is wearing in the painting, a booklet in the kit helps your kids to determine the differences. Your kids will be asked to write a label for one of the paintings and to sketch their own portrait on the provided self-portrait pad and pencil. 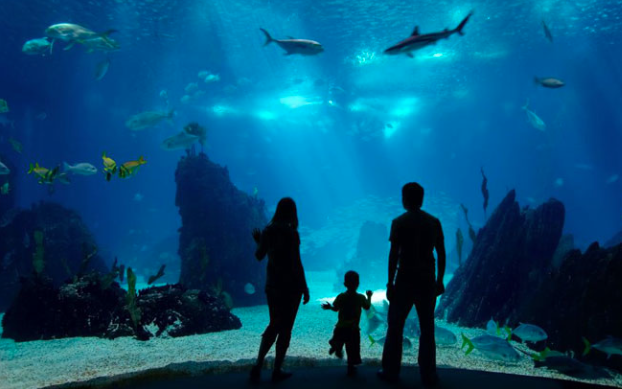 The Aquarium has over 17,000 animals and is home to a third of the worlds animal species! They have all kinds of exhibits including the the Atlantic Coral Reef where you can watch hundreds of colorful tropical fish swim and school in a 335,000 gallon, 13 foot deep exhibit. My kid’s found watching the divers feed the reef’s fish (which they do several times a day) fascinating! For all you JAWS lovers, there is a fantastic Shark aquarium that literally circles visitors in a ring-shaped exhibit. The exhibit I found interesting was their “Jellies Invasion.” According to the aquarium, Jellies are changing the balance of the Earth’s aquatic ecosystems with their massive swarms, voracious eating habits and their habitat invasions! They have a stunning exhibit where they feature nine different species of the prehistoric survivors. You see? There is always something to learn at the aquarium. 11. 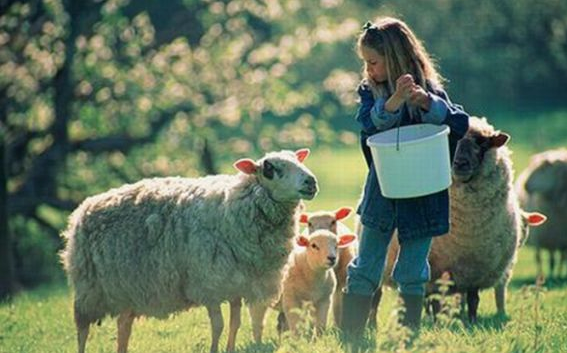 Take a weekend to enjoy a Farm Stay! 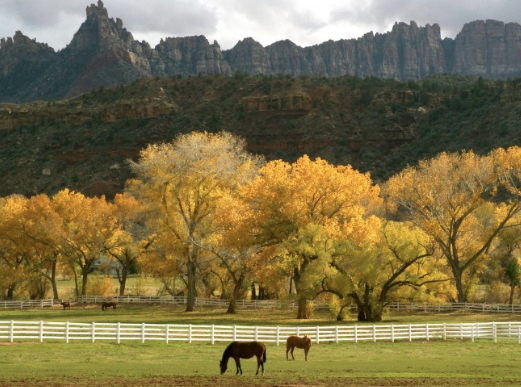 What is a “Farm Stay,” you ask? Well, there are a variety of ways to answer that! Some farms offer a chance to tend to livestock or harvest vegetables, some offer classes in organic gardening, cheese making or cooking and some are more luxury experiences where food is prepared by a master chef while you relax and enjoy the gorgeous views. What makes your visit a “Farm Stay” is the fact that every experience takes place on a working farm where you can observe or experience the daily rhythm of farm life. There are a variety of places you can stay around the city, the one my kids and I went to was Brightwood Vineyard and Farm in Brightwood, VA; 2 hours from Washington D.C. and 45 minutes from Shenandoah National Park. It was a beautiful, quaint guest house that let my kids feed the animals with them in the morning and offered fresh ingredients for you to cook homemade country meals! We loved it and would definitely go again. HERE is a blog I found about the house we stayed at with every detail you could possibly imagine. Remember there are many more options. Check them all out on the official FARM STAY WEBSITE. 13. 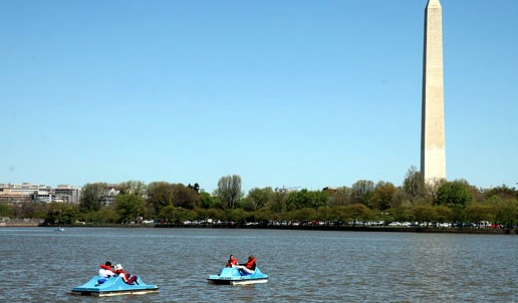 Make your way to the Tidal Basin for a whirl on the paddle boats! This is just a great thing to have in your back pocket for days that you’re all free but don’t have any plans. You’ll be in a great area to grab an ice cream for after, or take a long walk through our beautiful capitol to visit some monuments. One activity can very easily turn into a day full of things to do. Check out the link above for prices and reservation information, if necessary. 14. Cirque Du Soleil’s Amaluna (<– use this link to watch the preview) is coming to the National Harbour on July 31st!! Yep, you read that right. Grab your tickets HERE. 15. You can’t go wrong with a good old-fashioned county fair! 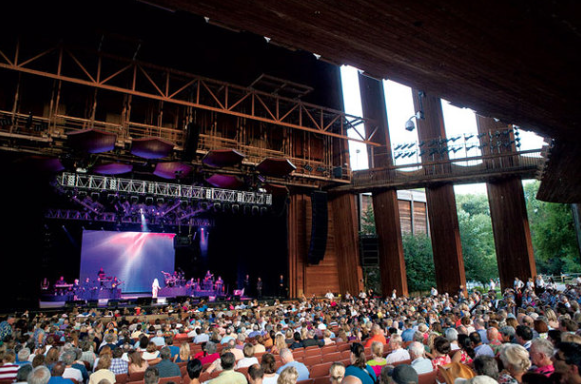 Maryland, Virginia and DC all host summer fairs with carnival rides, live animal shows, musical entertainment, arts and craft exhibits and too…much…food. HERE‘s a link to what each fair has to offer and where to find them. 16. 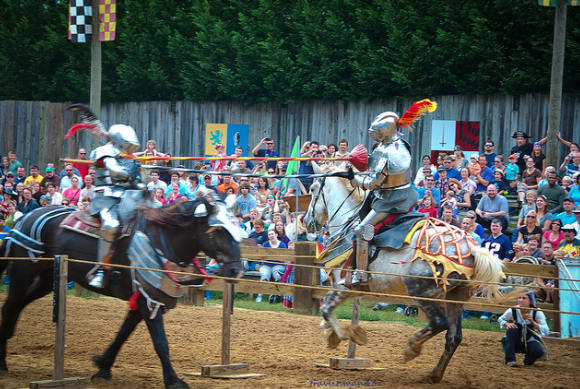 And since we’re on the topic of county fairs – have you ever been to the Renaissance Festival in Maryland? Tons of entertainment, crafting and feasting for all. The Maryland Renaissance Festival is a Renaissance fair located in modern day Crownsville, MD but set in a fictional 16th century English village named Revel Grove. The festival is spread over 25 acres and is the second largest renaissance fair in the United States. Guests and village “residents” all dress up and truly embrace the Renaissance spirit, making it a unique county fair (of sorts) to remember. You can check out ticket information and details HERE! The festival opens on August 23rd! Summer is almost through! Can you believe it? Here’s Part I of a list of things your kids are certain to go crazy for. Links to their websites are provided for more information. (Pictured above is #7 on this list). My kids and I had a blast at this place a few years ago. Of all the “U-Pick” locations around Virginia, this is the best. Get lost in their maze, swing on their rope swings, challenge each other to a game of giant chess, enjoy their rides, multiple play areas, rope web, giant slides and especially their ginormous jumping pillow. They also have a petting zoo where you can feed the animals and a wagon ride that takes you out to the acres and acres of fruit waiting and ready to be picked! 2. Water parks and amusement parks are a must do summer activity in my family. Our favorite activity every year is the “Old Time Photo Booth.” We always have such a blast dressing up, it has been a tradition since my youngest was in kindergarten. Of the Amusement Parks, Kings Dominion has always been our favorite. Fun Fact: The name given to the park is derived from the name of its sister park, Kings Island, and the nickname for the state of Virginia, “Old Dominion!” With 60 rides and attractions, and 14 roller coasters, it’s nearly impossible not to be entertained. And don’t leave without trying the Anaconda. Talk about a thrill! This year is also King Dominion’s 40th birthday! 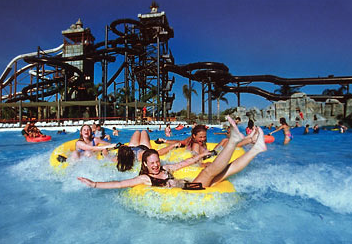 We have some great water parks not too far from Washington DC, also. Billy Goat Trail in Great Falls, section A (the Virginia side). This is not your average trail. You will enjoy varied terrain including beaches, rocks and trees where both climbing and walking will be necessary. You will have plenty of opportunity to dip your feet as well as take a moment to watch the waterfalls. Bring a lunch and plenty of water! This trail will feel like more of a workout than you’d anticipate. It takes about three hours (although the trail breaks a few times so you can easily make your way off it, if necessary) and is a fun and beautiful time with the family! 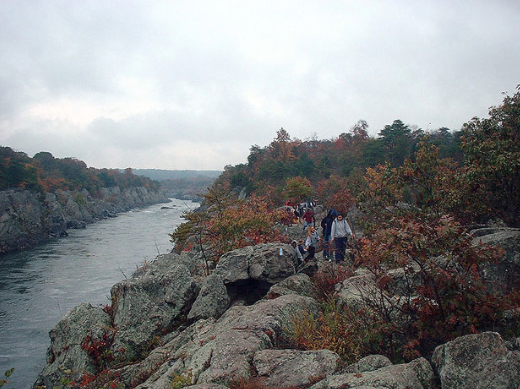 This trail is 18 miles and a huge attraction for DC residents! It links Theodore Roosevelt Island Park with George Washington’s Estate in Mount Vernon. The trail follows the course of the Potomac and passes through parks, yacht clubs, wetlands, neighborhoods, towns and wooded acres. Though a totally different vibe from the Billy Goat Trail, it’s just as beautiful and fun. 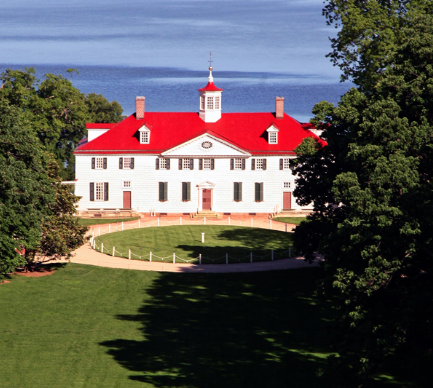 You can also make sure to spend some time touring the Mount Vernon estate (pictured) to add some historical relevance to the activity! 5. Give Biking a spin! DC has over 800 miles of biking trails, the most famous in the entire country is located in Washington D.C. and is called the Capital Crescent Trail. 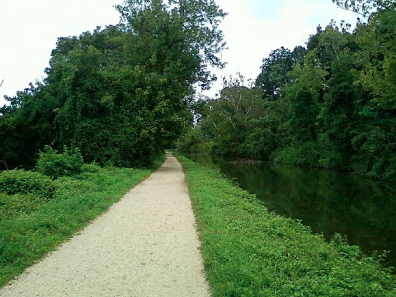 It is an off-road trail from Georgetown, D.C. to Silver Spring, MD and is suitable for walkers, joggers, bikers and rollerbladers. The trail was built upon the abandoned rail bed of the 11 mile Georgetown Branch of the B&O Railroad. It is a hard surface trail from Georgetown to Bethesda, and is packed crushed stone from Bethesda to Lyttonsville, in west Silver Spring. The trail consists of four bridges and two tunnels, all of which offer gentle gradients for leisurely but lengthy biking! Don’t have a bike? Not to worry, Capital Bikeshare makes it easy! Click HERE for more details. 6. Go to a Washington Nationals Game! You can’t go through the entire summer without watching the Nats play!! Make sure to check out their schedule and take your family out to a ball game! 7. Harpers Ferry Zip Line Canopy Tour! Just one hour outside of the DC Metropolitan Area, the ONLY Zip Line Canopy Tour in the region offers a 2-3 hour guided Canopy Tour thrill ride along the Potomac River where Maryland, Virginia and West Virginia come together. You’ll fly high above the river while enjoying stunning views and learning of the history with the help of their provided tour guides. You’ll also experience a few ladder climbs and two suspension bridges as well as a final free fall on the automatic hands-free safety belay — so be prepared for much more than a tour!! It’s a very memorable experience. Check out the link above to learn more. It’s that time of year! The weather is spectacular, the kids are out for the summer, pool days are on the weekly agenda —– and everyone’s stressing about where they’re going to watch the Fireworks. Well, your wish is my command! Here’s a list of Curbside’s favorite spots to watch the Independence Day fireworks. Happy Fourth! The National Mall, with Washington D.C.’s historical monuments and the U.S. Capitol in the background as a beautiful and patriotic backdrop to America’s Independence Day celebrations, the mall always serves as a winner for the 4th! I know most people worry about the throngs of people in attendance and try to steer clear of this location, but the Mall offers a full day celebration for things everyone in the family can enjoy. From the parade along Constitution Avenue in the morning, to the many street vendors, live music, and celebratory festivities that fill your entire day until you watch the spectacular display of fireworks over the Washington Monument at night; your Independence day will be packed with entertainment and things to do.Here’s the schedule:Washington D.C.’s Independence Day Parade starts at 11:45 AM and marches along Constitution avenue from 7th Street to 17th Street. Enjoy Marching Bands, military and specialty units, floats and VIPs. Plan to arrive early – the parade draws a big crowd! Smithsonian Folklife Festival hours are 11am – 5 pm. The event includes daily and evening musical and dance performances, cooking and craft demonstrations, storytelling and discussions of cultural issues. A Capitol Fourth Concert on the West Lawn of the U.S. Capitol. A 4th of July tradition includes a live concert by the National Symphony Orchestra and several pop artists performing patriotic music on the West Lawn of the U.S. Capitol Building. It’s free and open to the public! The Fireworks! They begin at dark, which is usually around 9:15pm. The fireworks are launched at the Lincoln Memorial Reflecting Pool and light up the sky above the Washington Monument. Another favorite is the East Potomac Park! 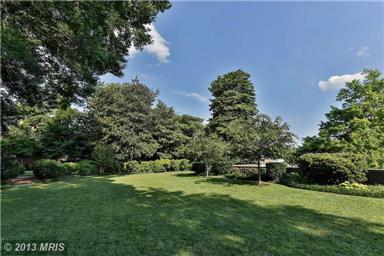 A 300+ acre peninsula located between the Washington Channel and the Potomac River on the south side of the Tidal Basin. The park is a popular place to spend the day biking, golfing, running, fishing, playing tennis and picnicking. It has fantastic views of the city and will not fail you when looking for a spot to watch the fireworks with the family. Your kids can enjoy playgrounds and plenty of space to run around; definitely a family favorite. You can even enjoy the public pool (open June to mid-October from 1pm – 8pm on weekdays (except Wednesday) and Noon – 6 pm on weekends) while you wait for the fireworks to start at 9:15! Number three requires tickets, but boy is it worth it! A dinner cruise aboard the Odyssey offers a first class view of the fireworks over the Washington Monument and throws in an amazing dinner, live entertainment and dancing, a premium open bar and great service. Check out their website HERE for more details. The Marine Corps War Memorial (a.k.a. the Iwo Jima Memorial) is located on Marshall Drive between Route 50 and Arlington National Cemetery, in Arlington,VA. It’s also right by the Rosslyn Metro Station if you plan on doing some drinking and want a safe trip home. Being right by the Arlington Cemetery, the Netherlands Carillon, a bell tower, and a beautiful park; you are at another gorgeous area for some sight seeing, picnicking, and firework viewing. 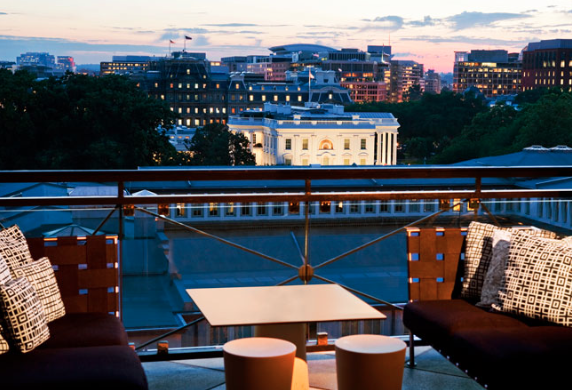 The Observatory above The Graham Hotel in Georgetown offers panoramic views of D.C., including the Washington Monument and her July 4th firework display. You’ll also have views of the other historic sights such as the Kennedy Center, Georgetown and the Rosslyn skyline. Get there early enough to grab your seat, order an awesome cocktail and watch the sunset as you prepare yourself for the show. Reservations are required, so book now! Check out their website HERE. The W Hotel in Washington D.C. is the closest hotel to the White House and has an incredible rooftop view of the city and the fireworks! It hosts an annual July 4th celebration entitled “Boom with a View” and is selling tickets NOW! Check ’em out HERE. The evening offers an insane view of the National Fireworks display from the P.O.V. Roof Terrace and Lounge while serving first class cocktails that makes any occasion a special one. Guests must be 21 years of age and with a valid ID. 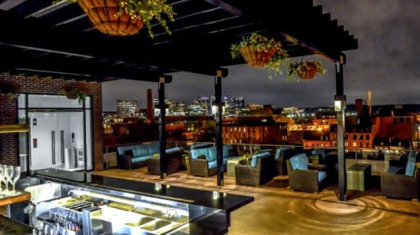 The Capella, in Georgetown, is another great rooftop with a view! Their package is a little unique and for a very limited number of people so call ASAP to see if there is space. It includes one night stay in one of their beautiful rooms with views of the C&O Canal and Georgetown. You will enjoy the fireworks from their private rooftop bar and lounge which offers alcoholic wines and cocktails as well as non-alcoholic cocktails. Capella’s Culinary Team will have a delicious barbecue that starts at 5pm – 8pm for 49$ per person and 29$ for children. On the morning of the 5th, the celebrations continue! 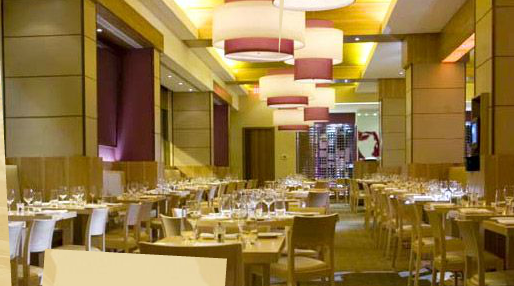 Your package will also include breakfast for two in The Grill Room from 6:30 am – 10:30 am. Each room and suite includes daily afternoon amenities and a refreshment center with complimentary drinks, coffees and teas. Talk about a 4th to remember! Package deals sold HERE. Last, but definitely not least, the Kennedy Center Terrace. With what is sure to be an amazing dinner partnered with a stellar show above an incredible view, you can’t go wrong with the rooftop of the Kennedy Center. Again, this spot will be in demand — book your seats now! Happy Independence Day from Curbside!! 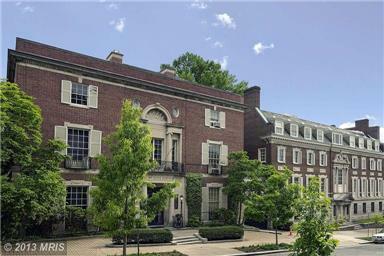 Last night’s Summer Garden Soiree, hosted by Capitol File and Coldwell Banker, was held at the Textile Museum at 2320-2330 S Street in Kalorama. It was not only an event to promote the historic property, listed with Coldwell Banker, but an opportunity to give back to the community. Guests could enter a raffle to win a design package put together by several DC Design Center showrooms. All proceeds benefited the DC Central Kitchen. In addition to providing 5,000 meals daily to homeless shelters and transitional homes, they offer a rigorous Culinary Job Training program for unemployed men and women to give them the career skills to change their lives. Now that’s a cause worth supporting! The Moet on ice was flowing as guests walked the property and its remarkable gardens. 2320 was designed by John Russell Pope, the world renowned architect who also designed the Jefferson Memorial and the National Gallery of Art’s West Wing. This is probably the only residential piece of property designed by him that will ever come on the market. It has a spectacular 34,125 sq.ft. 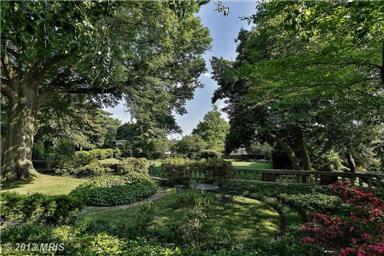 landscaped formal garden with one of the most beautiful trees in all of the District. The gardens extend to the former chauffeur’s residence on Decatur Place, also designed by Pope and originally built as part of the home. The adjacent property at 2320 was designed by another prominent architect, Waddy Butler Wood. Listed with Sylvia Bergstrom, Marin Hagen and Joe Zorc of Coldwell Banker; this is truly an opportunity to purchase a bit of the capital’s history for a mere $22M! A European Ambassador was in attendance last night, though I won’t say which one! Word is they are seriously considering a purchase. The DC Hot Spots For The World Cup! The U.S.A. game against Portugal was watched by more than 24 million people, making it soccer’s most watched game in American TV history. So secure your seat early for any and all of your anticipated World Cup games at one of the below Curbside picks for watching the World Cup in D.C.!! 1. Sequioa My personal pick is Sequioa. The fact that I can’t find this on anyone’s list is shocking. With their huge LED TV screen on their newly revamped outdoor patio with gorgeous river views, everyone should be rushing to grab their seat! This is the spot!! The food and drinks will be a cut above any sports bar. Sequoia’s stellar location makes it easy to continue bar hopping in Georgetown after the game or grab a kayak and go for a celebratory ride on the river afterwards. 2. Redline Gastrolounge This Chinatown drinkery will be serving nationally themed drink specials depending on what countries are hitting the field that day. Get there at the right time and you’ll find yourself at a personal tap table booth where you can pour your own brews. Be sure to check out the chipotle BBQ’d tilapia tacos….yes, please. 3. Penn Social Another Chinatown bar who’s going all out for the World Cup is Penn Social. Fans can enjoy “Fantasy Football” games the day of the matches to really get them in the spirit and numerous drink specials such as 3$ Bud Lights; but it’s really the TWENTY-TWO feet of screen space that makes this location a Curbside DC fave! 4. Blackfinn The Finn is a great spot to enjoy American bar cuisine and an extensive list of craft beers. It’s the perfect place to meet up with friends and is sure to have a ton of DC natives cheering on their favorite team. The US games have been very spirited here! Finn is packed with TVs so you can catch the game action from multiple angles. 1620 I Street NW Washington D.C.
5. Public Bar I love the vibe at this place for any sporting event. It’s also loaded with TVs. They have a rooftop bar area with rooftop summer specials that include Corona and Pacifico buckets for 20$ Monday – Thursday (which overlaps with the Thursday game! ), and orange crush and premium lemonade for $5 each from Thursday – Saturday starting at 8pm. They’ll have a special World Cup menu to go along with the game but are not sharing it publicly – so check them out and see what’s up! 6. H Street Country Club This is the perfect place for you, if you can’t sit still! H Street Country Club offers a round of (mini) golf with your World Cup match. The bar will be open at noon every day during the World Cup and has the only miniature golf course in all of D.C. You’ll also find 25+ types of tequila, a menu of artisan cocktails changing weekly, and a full menu with vegetarian and vegan options. 1335 H Street, NE Washington, D.C.
1) First impressions are the only impression. No matter how amazing the interior of your home is, buyers have already judged it from the outside. Make sure the lawn is mowed; there are no dead, potted plants; and you’ve done some sprucing with inexpensive shrubs and colorful flowers. 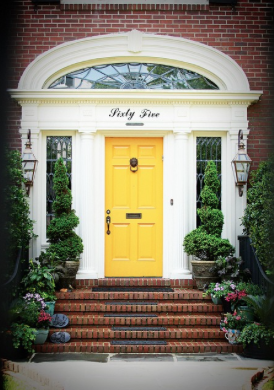 The entrance into your home should be just as welcoming. Add a bench at the entrance, a fresh vase of flowers or even some cookies! 2) Always be ready to show your home. Buyers will be interested in viewing your apartment without any warning. While you’re selling, make sure your house is in tip-top shape from the day it’s on the market, till the day you get it sold. Clean your dishes every night, don’t let dust bunnies collect in the corners and make sure your bathrooms are sparkling. I know it’s not convenient, but if buyers are viewing a dirty home they will automatically assume that they’ll be moving into someone else’s mess and will be turned off the second they walk in the door. 3) Your kitchen is your priority. Selling a home with up to date, stainless steel appliances is a huge plus. A buyer could knock $10,000 off for an out of date kitchen. But, I get it! Remodeling is expensive. The fastest and most inexpensive way to update your kitchen is with a fresh layer of paint and new cabinet hardware. 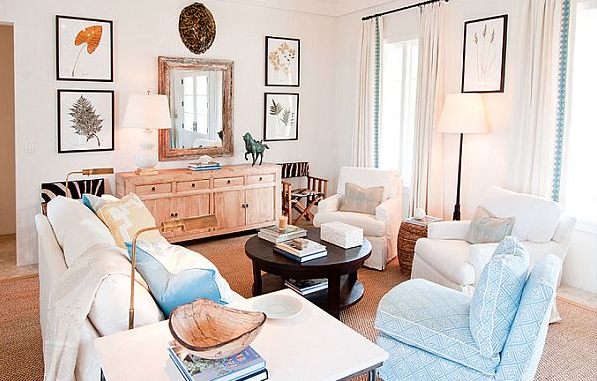 Choose neutral colors so your potential buyers can begin imagining their own style. If you have a little more money to spend, install one stainless steel appliance. If buyers see just one expensive, stainless steel appliance, they’ll assume the rest of the kitchen is much more updated than it is. 4) Depersonalize your home. The more pictures or memorabilia that you can put in storage the better. You want your home to look happily lived in, but not so much that potential buyers can’t imagine your home being THEIR home. If possible, consider hiring a stager. Staging a home simply means arranging your furniture to best show off the floor plan and to maximize the space. 5) Avoid mammoth upgrades. Quick fixes and updates are a good way to get your money’s worth. Re-modeling the entire home?…Not so much. You will most likely not get your money back. Repainting your walls, replacing closet and cabinet hardware, making sure doors and closets open without squeaking, fixing leaky faucets and cleaning out grout are upgrades more worth your time and money! 6) Hide your furry family members. Unfortunately, your cats and dogs don’t help you when selling your home. Buyers will automatically assume your home is dirty, and maybe even smelly. When you know buyers will be touring your home, arrange for your animals to spend the day at daycare. 7) Choose the right agent. Make sure he/she is informed, constantly monitoring the Multiple Listing Service (or MLS), is aware of what properties are going on the market, and what houses in your area are going for. Find someone who is tech savvy and thus has a number of tools and resources to get your home sold. 8) Maximize the light in your home. Take down the drapes, clean the windows, trim the hedges, change the lamp shades and increase the wattage of your light bulbs! Do what you have to do to make your home bright and cheery. 9) Everyone is looking for storage. Take half of your stuff out of your closet and neatly organize what’s left. 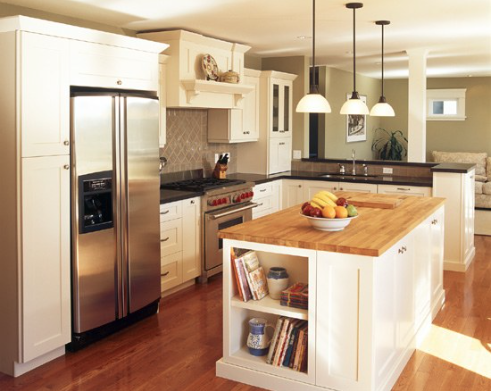 All your cabinets should be kept neat and tidy, they will look more spacious and taken care of. 10) Find out what your home is worth and shave off 10%. It’s risky, but you’ll be flooded with so many offers that buyers will end up bidding higher and higher hoping to outbid their competitors. You’ll either walk away having made what your home is worth, or more.